Back in 2008, Time Magazine published an article pointing out that vinyl records had found their groove again with sales up 37 percent. Vinyl sales hit another high in 2009. You can expect to see the same in 2010. WIth record companies hoping to find any sales vehicle possible, many of them are keeping up with the small but growing demand. Some are even making vinyl more attractive with exclusive releases and collectibles. There are some cool platters to be had. Adding Portability To The Vinyl Renaissance. Here's the thing. Most people know CDs are slowly fading away as a footnote into digital history (of course, we said that about vinyl too). But one has to wonder. Is the vinyl surge more of a fad than the future? One of my friends doesn't think so. 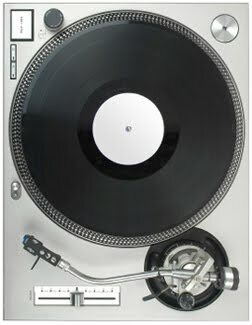 He just bought a Technics turntable (used) and USB turntable (from the Sharper Image). He bought the first because he wanted to hear the warmth dropped back in the music. But he bought the second to convert any new albums to digital. Most albums, he said, see one play on the USB turntable because he doesn't want to risk any damage. For $99, USB Turntable converts vinyl LPs and 45s into digital audio (photo left). It comes with software for Windows and Mac. My friend has a Mac (v. 10.5), which is perfect because you can export the music directly into iTunes. What struck me about the USB Turntable are two important features. It has an adjustable anti-skate control for stereo balancing. And it allows you to tag the audio files (embed the artist name, album, song title). It also has 1/8” stereo line input so you can port in other sources (like cassettes). The whole idea is to play vinyl right when you can. And then record it so it's as portable as the rest of your collection. There are a few other cool things coming up for vinyl. Slayer just announced The Vinyl Conflict, a high-end 11-disc vinyl box set that collects the band's entire sanguine American Recordings catalog from Reign in Blood to World Painted Blood. Expect more of these. And in a creepy cool sort of way, there is a new company in the UK called And Vinyly that will press your ashes into a vinyl record with your favorite songs and a voiceover (or anything audio). It's not cheap, but it's your chance to make the best album ever and go for a spin from beyond the grave any time someone plays you. 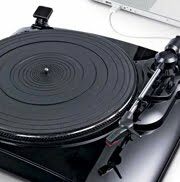 The USB Turntable is available from The Sharper Image. The Sharper Image doesn't carry as much eye-catching stuff as it used to, but this gadget works. No, it won't satisfy the purest. It just makes the music portable. As for vinyl, I'm young enough to have missed the transition to CDs. But I have to say, thumbing through my friend's collection, looking at the art, and pulling the vinyl from the sleeve adds something to the experience that CDs don't. Besides, if Slayer (whether you like them or not) has a hit collectible on vinyl come October, expect more artists to do the same. Jack White has already done something interesting with vinyl. And many of the artists we reviewed are all pressing disks these days.